« Is The White Paper Dead for B2B Marketing? Certainly there are tools out there to help you measure your efforts in social media but sometimes it’s not the tool’s fault it’s the business case. Many people take a classic approach to social media and treat it like just another media channel and expect to see instant results like they do with other online media like banners, text links and search. This is why they find it hard to see results that make for a strong ROI. In the case of social customer support I would argue that this is the single best place to focus your social media efforts since it can reduce customer churn and increase retention rates faster than any other program we have ever seen before. Spotting a customer issue, responding to them and solving their problem in minutes using social media provides what can only be called an exceptional customer experience. Not only that but a recent Forrester study showed that customers actually prefer a better customer experience compared to everyday low prices, and moreover great customer experiences drive positive word of mouth (WOM). So why wouldn’t you center you social media efforts in this area? Layering on social media tactics for support can also decrease your contact center costs. Tactics like providing free support forums, peer to peer collaboration and discussion threads on social networks and support through microblogging can act as a string of defensive before a person calls into you contact center which is the highest cost support vehicle any company can have. Not everyone enjoys calling into a contact center and more and more as social media evolves they will expect to get support using the channel that the customer prefers and feels most comfortable using. The downside of poor customer service has been well documented on the web more and more people are taking to the web to warn other would be customers of their dissatisfaction with your customer service so don’t let that be your company! Great customer service enabled by social media is a no brainier and it is the single best place to build your business case for social media! This is a great post that brings up some very interesting points. Social media is a great way to monitor and respond to customer service issues, and it’s good to see that businesses are starting to understand the benefit of using various social media platform to speak directly to their target audiences. It’s important to note that there are solid ways to measure social media’s value (you can even apply some of the more traditional measurement tactics!) It’s really about setting the metrics and goals, implementing the necessary back-end technology (web analytics, tracking etc. ), and setting parameters for the entire campaign prior to launch. 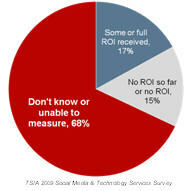 If you know what you want to achieve on social media, then rest-assured there is a way to track it’s ROI. Amazing how many people do not investigate their marketing beforehand and equally shocking is how many do not follow up to see their ROI… Why work hard at it? The answer: It’s impossible to really know. – That handshake cost me approximately $20 (time, travel, etc.) and didn’t earn me any money in the following 3 months, so ROI was 0% (($0-$20)/$20). – Meeting those people at that social event cost me $10 and resulted in $40 of sales, so ROI there was 300% (($40-$10)/$10). See where this is going? Calculating ROI for these social activities totally misses (if not devalues) the point of such social: relationships. What is the relationship value of such events? – That handshake cost me no relationship value, and earned me tremendous relationship value. Now that person and I are close friends, and he recommends my services to all his colleagues. – Meeting those people at that social event cost me nothing (save opportunity cost, perhaps). It earned me a lifelong trusted advisor role with two of the guests. People — especially businesspeople who’ve studied finance — like nice objective values. It helps to compare things. And that’s important when comparing avenues of expenditure. But objective valuation is only part of an honest evaluation. The subjective matters as well — in particular with human beings who are proven to act irrationally based on subjective criteria, including hiring people “they know” rather than non-vetted service providers. Successful activity on social media follows the same rules. Focus on relationship value. That’s where the meat is. Transactional value of social media activity is just data. @Glenn – thanks for submitting some really in depth thought on this space – I was looking at it clearly more functionally but I can appreciate your angle of trying to quantify the unquantifyable!